Important! Texas Senate Democrats Might Pick Next Governor/Lt. Governor – Call Republican Senators NOW! Please forward this important message! Thank you Senator Dan Patrick for bringing this to our Attention! I am going to make this as straight forward and simple as I can. I am not saying that the current Governor or the current Lt. Governor will win their elections, but we need to plan ahead just in case. The bottom line is, if the Governor, the Lt. Governor, or both win their election bids for President and Senate, then the Texas State Senate would be in complete control of picking the next Lt. Governor and/or Governor. According to State Senator Dan Patrick, if this happens, it is a once in a life-time constitutional event that would be one of the most important and influential decisions ever. We MUST be prepared if this happens. Democrats Could Pick our Next Governor! How Do We Prepare Ourselves? The Republicans only hold a slim Majority in the Texas State Senate. There are 19 Republicans and 12 Democrats. If at least 16 Republicans are not completely united, then the Democrats could very possibly pick the next Texas Lt. Governor and/or Governor! THAT WOULD BE DISASTEROUS. The Republicans hold the majority and therefore the Republicans should make that decision. Would the Democrats EVER let Republicans make this decision if they were the majority? NO! We have to CALL or EMAIL all the Republican State Senators and ask them to join together and agree that the Republican Majority will be unified if this very important decision actually ends up happening. We also need to tell the Republican State Senators that the vote needs to be a public vote so that we can see how the votes are public because a Senator could tell us he/she is unified but then that Senator can break their promise in a secret vote. Find your Texas State Senator Contact info here. State Senator Dan Patrick came to our SREC meeting on Saturday, October 1st, 2011. Senator Dan Patrick expressed to us the important and dire nature of this situation. He asked us on the SREC to urge the Senate Republicans to be unified and to have a public vote. In response to Senator Patrick’s request, I had prepared a resolution to present to the SREC. The resolution was to urge Senate Republicans to be unified and to have a public vote. 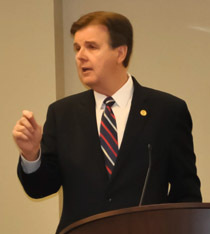 Senator Dan Patrick urged the SREC to pass this resolution and called it the most important resolution that this SREC will have ever voted on. After some minor changes, the Resolution passed nearly unanimously. Only 1 SREC member out of 62 members voted against the resolution. Below this video, I have posted the final resolution that the SREC passed. But first, here are the comments that State Senator Dan Patrick made to the SREC. Resolved, that a copy of this resolution be delivered by electronic mail to each Republican member of the Texas Senate for their signature or posted on the Republican Party of Texas website in a secure means which allows only those members or certified candidates to sign on electronically. In Summary: PLEASE CALL or EMAIL YOUR REPUBLICAN STATE SENATOR! If you are not on my email list and you would like to get updates from me about the SREC votes and other Texas Political News, or if you would like to ask me a question then please email me at mdbellow@gmail.com, and I will put you on my email list and/or answer your question. Thanks!